Transform and heal yourself with this unique and integrated yoga training course. Learn healing tools that inspire and change how you see your world. Finally take back your Power and un-earth your authentic self. 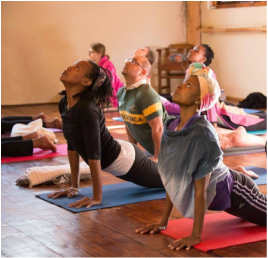 This 200 hour African Kemetic Yoga™ Teacher training course begins on 4 September 2017 and ends with graduation on 30 September 2017. The group will meet every weekend for two half hours over eight months. Allowing you, the yoga student ample time to fully assimilate and practice the techniques, methodology and philosophies covered in the training. Topics covered include and introduction to Kemetic Cosmology and Sciences, Indian philosophies and various styles of yoga, providing You with an all rounded, integrated fusion of African Kemetic Yoga. All books are available on Amazon, or can be loaned from the studio. Investment: ZAR26 000 includes training and certificate only, teaching manual is extra at R600. (i) register and pay in full to be eligable to receive a R500 early bird discount by 15 January 2017. (ii) register and pay a R6000 deposit, with R5000 equal installments over 4 months. Enrolment Now Open for the January 2017 teacher training intake.